Equity markets rallied sharply on Thursday, with the benchmark Sensex closing only a per cent shy of its new all-time high. The benchmark Sensex gained 413 points, or 1.1 per cent, to end at 38,546, while the Nifty rose 125 points, or 1.1 per cent, to close at 11,570. 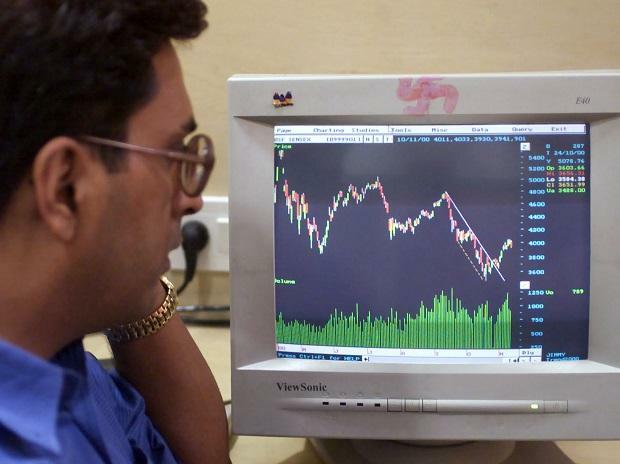 The Sensex has gained over a per cent for a fifth time this month, and eighth time in 2019. Hopes of another interest rate cut by the Reserve Bank of India (RBI) fired up banking stocks, with the Bank Nifty climbing to a fresh record high of 30,420. Sentiment was also buoyed by hopes that global monetary policy will remain loose due to fears of recession in the US. 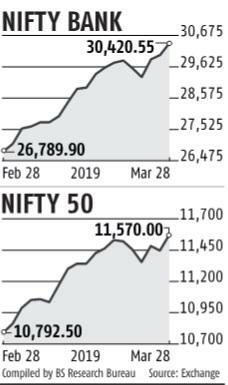 Benchmark indices have now rebounded 9 per cent from their 2019 lows on February 19 on the back of nearly Rs 50,000 crore ($7 billion) of foreign inflows. On Thursday, foreign portfolio investors (FPIs) pumped in close to Rs 4,000 crore into domestic stocks. During the start of the week, Indian markets had dropped amid a sell-off in global equities, after a bond market indicator — yield curve inversion — signalled recession in the US. While such a scenario is bad for global economic growth, experts say, it may impact Asian markets at least in the short term. “We find in the period up to 12 months after yield inversion, Asian equities tend to perform well. Upon conversion of the 10-year-3-month yields (which happened on March 22), Asian equities rose 3 per cent, on average, in the 12 months thereafter, but fell 9 per cent in the 18 months thereafter,” said Herald Van der Linde, head of Asia equity strategy at HSBC. Experts said the sharp rally was due to domestic factors, given global market performance was a mixed bag on Thursday. Thursday marked the expiry for the March series derivatives contract. The benchmark Nifty ended the series with 7.2 per cent gain — most since the November 2018 series. Meanwhile, the Bank Nifty jumped 13.6 per cent during the month. “The Bank Nifty propelled to a new high on hopes of rate cut. The slide in India’s 10-year bond yield further fuelled expectations. Global economic growth concerns and the Fed’s dovish view on rates will give a positive impetus to emerging markets like India,” said Vinod Nair, head of research at Geojit Financial Services. The biggest gainers in the Sensex pack were HCL Tech and SBI — each gaining over 3 per cent — followed by YES Bank and Axis Bank, which rose over 2.5 per cent each. Among the top loser were ONGC and Tata Steel, who declined nearly 2 per cent each. Indian markets are set to end FY2018-19 with stellar gains. With just one session to go, the Sensex is up 17 per cent this fiscal, its best showing since 2014-15.